Japanese mathematics (和算, wasan) denotes a distinct kind of mathematics which was developed in Japan during the Edo period (1603–1867). The term wasan, from wa ("Japanese") and san ("calculation"), was coined in the 1870s and employed to distinguish native Japanese mathematical theory from Western mathematics (洋算 yōsan). In the history of mathematics, the development of wasan falls outside the Western realms of people, propositions and alternate solutions. [clarification needed] At the beginning of the Meiji period (1868–1912), Japan and its people opened themselves to the West. 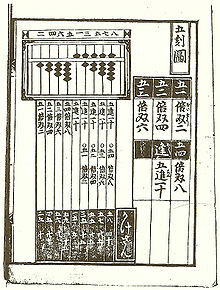 Japanese scholars adopted Western mathematical technique, and this led to a decline of interest in the ideas used in wasan. This mathematical schema evolved during a period when Japan's people were isolated from European influences. Kambei Mori is the first Japanese mathematician noted in history. Kambei is known as a teacher of Japanese mathematics; and among his most prominent students were Yoshida Shichibei Kōyū, Imamura Chishō, and Takahara Kisshu. These students came to be known to their contemporaries as "the Three Arithmeticians". Yoshida was the author of the oldest extant Japanese mathematical text. The 1627 work was named Jinkōki. The work dealt with the subject of soroban arithmetic, including square and cube root operations. Yoshida's book significantly inspired a new generation of mathematicians, and redefined the Japanese perception of educational enlightenment, which was defined in the Seventeen Article Constitution as "the product of earnest meditation". Seki Takakazu founded enri（円理:circle principles）, a mathematical system with the same purpose as calculus at a similar time to calculus's development in Europe; but Seki's investigations did not proceed from conventionally shared foundations. Replica of Katsuyo Sampo by Seki Takakazu. Page written about Bernoulli number and Binomial coefficient. The following list encompasses mathematicians whose work was derived from wasan. ^ Campbell, Douglas et al. (1984). Mathematics: People, Problems, Results, p. 48. __________. (1998). "Les mathématiques peuvent-elles n'être que pur divertissement? Une analyse des tablettes votives de mathématiques à l'époque d'Edo." Extrême-Orient, Extrême-Occident, volume 20, pp. 135–156. Kobayashi, Tatsuhiko. (2002) "What kind of mathematics and terminology was transmitted into 18th-century Japan from China? ", Historia Scientiarum, Vol.12, No.1. Kobayashi, Tatsuhiko. Trigonometry and Its Acceptance in the 18th-19th Centuries Japan. Morimoto, Mitsuo. "Infinite series in Japanese Mathematics of the 18th Century". Morimoto, Mitsuo. "A Chinese Root of Japanese Traditional Mathematics – Wasan"
Ogawa, Tsukane. "A Review of the History of Japanese Mathematics". Revue d'histoire des mathématiques 7, fascicule 1 (2001), 137-155.